Oct. 3, 2017 11:45 a.m.
Two kestrel chicks who got out miraculously unscathed during the Elephant Hill wildfires are now healthy and back flying in the wild. 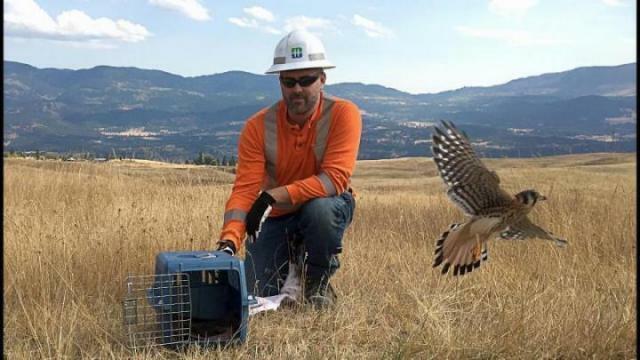 The two birds – part of the falcon family – were released Friday by BC Hydro’s environmental specialist in Pritchard, near Kamloops. The pair was found in July, when the lion’s share of the wildfire tore through the dry forests near Ashcroft and Cache Creek. Hydro crews were sent into the area to restore power and replace damaged power poles. Amid the scorched and blackened trees, two recently hatched baby kestrels were found nestled into a power pole, explained Dag Sharman, BC Hydro’s community relations manager. The crew delivered the chicks to the Wildlife Park Rehabilitation Centre in Kamloops, where they underwent months of treatment. But the chicks – now strong and healthy – couldn’t go back to where they once called home. Because of the damage to vegetation caused by the fires, a BC Hydro environmental specialist deemed Ashcroft unfit for the birds’ basic needs, Sharman said. Instead, they were released on a hillside in Pritchard. It’s not uncommon for hydro crews to encounter wildlife, Sharman said, such as ospreys nesting on the top of poles, wood peckers drilling into them and animals climbing them. But this struck a different chord for work crews on the frontlines of the worst wildlife season in B.C. history – one that left many other animals injured, stranded or dead.